I am in LOVE w/a Jar of Peanut Butter! OMG!! This just might be the BEST lunch I’ve ever had in my entire life! 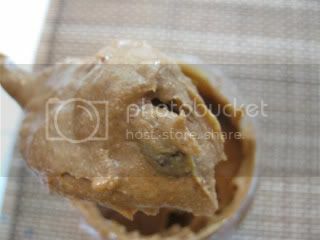 Seriously – I had no idea how amazing the PB&Co Cinnamon Raisin Swirl Peanut Butter could be. Did you all ever have cinnamon/sugar toast when you were little? It is something my sis & I made ALL the time. 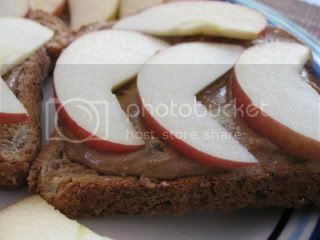 Well, this peanut butter reminds me exactly of that….plus more! 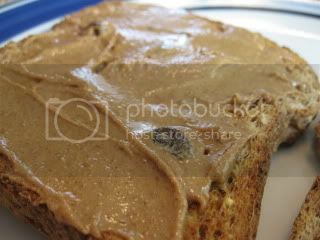 Picture Cinnamon Sugar Toast Plus Peanut Butter Plus BIG Plump Raisins – All Mixed together. It’s chalked full of raisins – you can feel them when you stir. It’s super thick and creamy as well – I had a hard time not EATING this spoonful when I took the picture 🙂 I did however, lick the lid, well, cuz, you know, you can’t be wasteful, right?! 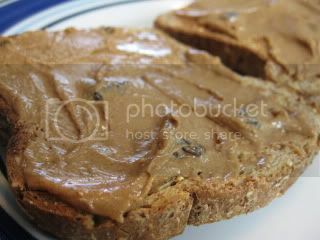 🙂 I layered two BIG tablespoons onto two slices of Ezekial Bread. Can you see the “flecks” of cinnamon? But, why stop there?! You need to add some extra crunch and “sneak” in some fruit. 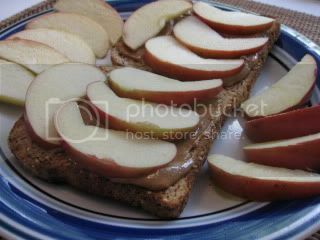 I sliced up an organic fuji apple and added thin layers to each slice. 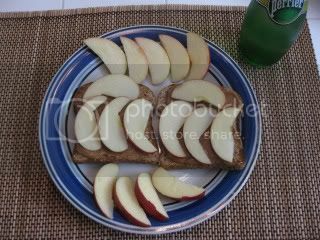 All together with the extra apple slices on the side served up with Perrier Sparkling Water! Layer your two halves on top of each other and slice in half. 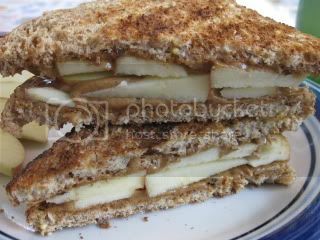 And enjoy that cinnamon raisin peanut buttery-ness as it wraps itself around the crunch apples! Absolutely AMAZING! This lunch was sooooo good I cannot wait to do it all over again!!! Have you ever had a meal like that? The best part is that this entire meal is only 7 Weight Watcher Points!!! This is by far my favorite flavor so far! The funny part to me is I am pretty loyal to my TJ’s Organic Crunchy (nuts only!) pb….but,. this pb, rocked my world! The ingredients are clean too – you can regognize them all. I’d definitely buy this if I ever saw it on the shelves in California! And if you have it in stores near you, BUY IT – you won’t be disappointed! YUM! Hope your Friday is flying by ~ Mine sure is! See you all later tonight! « Eat what you crave & The Holey Donuts Winner!! That's my favorite PB & CO peanut butter too! 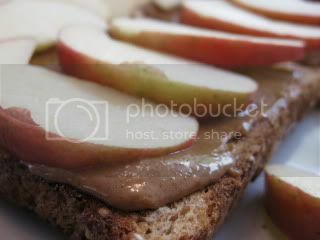 you and me both girl – i am infatuated with that pb =)! 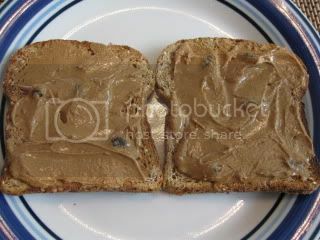 You should try it on Ezekiel CINNAMON RAISIN bread. It's awesome. i LOVE pb & co. too!! all of their flavors are spot on!! Janetha ~ I DO LOVE it – thanks so much again and again and again!!! Maybe you could pick the raisins out? K ~ Thanks I got a little picture happy. I am with you – it rocks! My Myers ~ I couldn't agree more – pb should definitely have it's own food category on the food chain. April ~ I need to try the other flavors but so far this is my fav! 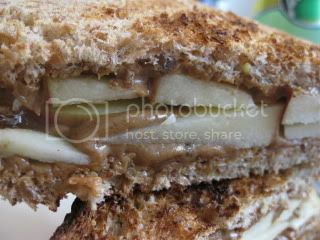 Anne ~ It was fantastic – a definite must try sandwich! Broccoli hut ~ you know I was thinking that as I was eating it too…must try!